It was only a matter of time before YouTube added live streaming. While all eyes are on the horse race between live streaming sites like UStream, Livestream, Justin.tv and Stickam.com, the gorilla that might end up winning the live game is none other than YouTube itself. Until now, YouTube had shyed away from live streaming aside from a handful of concert events like U2 and Alicia Keyes. But this morning at 11 AM (PT), long-running news and tech web series Rocketboom fired up its first live streaming show from its YouTube channel, as part of YouTube’s live streaming alpha launch. The live show ran like an internet version of The Today Show, bringing out the full Rocketboom cast of mememolly, Kenyatta Cheese and Elspeth Jane who handed off segments back and forth from different setups. mememolly even had her own weather and cooking segments. So far the live player is not embeddable so that means heading directly to Rocketboom’s YouTube channel. The social stream to the right of the video player allows for live commenting directly on the YouTube page. UPDATE: We’re also hearing from Howcast that they are participating in the live streaming aplha test today and are set to go live at 9 AM (PT) on their YouTube channel. Also Next New Networks is part of the live streaming alpha test as well with The Key of Awesome, Indy Mogul and JRSportsBrief all streaming today and tomorrow. Celebrity-focused Young Hollywood rounds out the group of 4 channels in the alpha test. These are all part of the alpha test of the live streaming product over the next two days that YouTube will be evaluating before rolling it out to the rest of its partners. The live streams are currently available globally. “Our hosts are all eager to test the live capabilities to make the shows come alive for viewers in a new way that explores this important next step in Web entertainment,” said Vanessa Pappas, VP, audience & strategic partnerships at Next New Networks. Indy Mogul — The original do-it-yourself filmmaking how-to series will stream live Monday, September 13 at 4:45 – 5:30 PM EDT, giving fans a new way to experience the show. “Indy Mogul” live viewers will be given the chance to interact with hosts and other viewers to ask questions and share feedback on special effects know how. JRSportBrief — Sports news Web series “JRSportBrief” joins YouTube live streaming on Tuesday, September 14 at 4:00 – 4:30 PM EDT to give live viewers up-to-the-minute sports news. 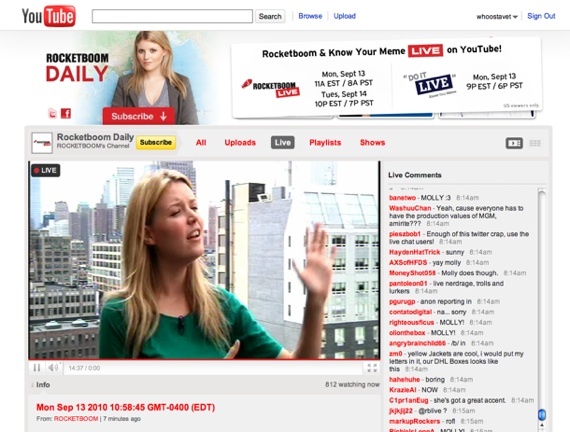 Rocketboom Live is an hour-long variety show, featuring all Rocketboom network shows: Rocketboom NYC, RocketboomTech, Know Your Meme and anchored by Molly of Rocketboom Daily. This broadcast is our web-friendly take on the TV morning show format, featuring a cooking segment, weather reports, and special guests the Universal Record Database (who will be setting records on air) and New York Times technology writer Nick Bilton (talking about his new book, I Live in the Future & Here’s How It Works). Know Your Meme: DO IT LIVE! Know Your Meme: DO IT LIVE! offers an hour of Internet culture for both meme savants and n00bs, inviting the YouTube audience to spend an hour touring the Institute for Internet Studies, the fictitious setting of the popular web series Know Your Meme. Our four hosts, Internet scientists Yatta, Elspeth Jane, Mike & Patrick, will give an introduction to memes and conduct experiments that answer important questions like, “How much auto-tune is too much auto-tune?” and “What happens when you try to copy pasta?” The audience will be excited by the launch of the new Know Your Meme Dispatch Series, which crowdsources informative videos from our most dedicated viewers. Tuesday’s broadcast of the Rocketboom Live variety show spoofs the late-night talk show genre, with internet experts competing in a Know Your Meme trivia competition, guest Seth Porges of Popular Mechanics (showing us the world’s most useless gadgets) and live performances from juggling mogul Brian Dubé and a surprise musical act.